Burbank, CA – As traditional Chinese Kung Fu began to emerge over two thousand years ago, it wasn't until the late 1800s that it took its first step on American soil. However, it wasn't until the late 1950s that Kung Fu was openly taught to non-Chinese by Ark Y. Wong. This week, the Martial Arts History Museum was honored to host a photo exhibit and lecture about the History of Kung Fu in America by Doug Wong, Jerry Lem and Carl Totton. It was a record crowd as martial arts enthusiasts enjoyed a photo exhibit of some of the greatest historic photos of Kung Fu pioneers who brought the Chinese arts to the West. 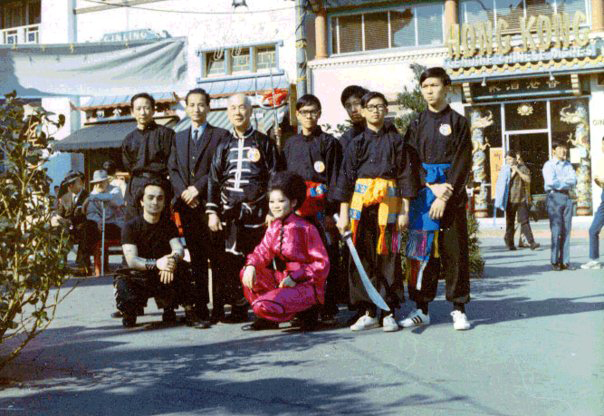 Many of the photographs included such Kung Fu leaders as Lau Bun, Doc Fai Wong, Buck Sam Kong, Leo Fong, Eric Lee, Doug Wong, Ark Y. Wong, James Lew, Gerald Okamura, Bruce Lee, Jimmy H. Woo, Carrie Ogawa-Wong, John Lem, Y.C. Wong, Lily Lau, Gini Lau, John Leong, Raymond Chow, Brendan Lai and many more. The photo exhibit also included a hour and a half lecture about Kung Fu in America, the history of the arts and how it changed our films, television and more. “Doug Wong is without a doubt, the greatest historian of Chinese Kung Fu in America and having him speak at the exhibit was a unique opportunity. Additional speakers for that evening included Jerry Lem, the son of pioneer John Lem and historian Carl Totton. “There's never been a book documenting the history of Kung Fu in America and having this exhibit is our first step in making that a possibility,” notes Doug Wong. "Ark Y. Wong, who was my instructor, literally changed the world." Although many of the movies such as Dragon give credit to Bruce Lee for being the first to teach non-Chinese that art of Kung Fu, it was Ark Y. Wong who risked his life by breaking with tradition. Lee was still in high school when all this occurred. Ark Y. Wong taught Kung Fu in America for man decades before he made the decision to open the doors of the art. "This was not as easy task and he could have lost his life, but he prevailed and as a result, Kung Fu has spread throughout the world," adds Matsuda. For more information about the Martial Arts History Museum, please visit www.Mamuseum.com or call (818) 478-1722.